I’m obsessed with tongues: the tongue as speech, as selfhood, as hunger. The tongue as the locus of agency, an intermediary between body and voice. 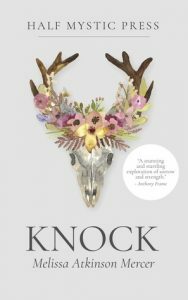 Knock is a chronicle of this obsession, beginning and ending with the tongue. From the title of the opening poem—“The first cure for depression is they cut out your tongue; the second is they try to give it back”—the book interrogates how much control we can truly have over our own troublesome tongues. I, for one, have always been someone who vastly prefers listening to speaking, preferring to know rather than to be known. But, like any delicate duality, the giving/receiving of speech requires a balance I often lack. I find myself frequently silent: in large groups, in smaller groups, on social media. And, if speaking is an act of self, my silence can render me fractured, fragmented, disappeared. I worry that I participate in the self-creation of others at the expense of my own creation. On the other hand, a dear friend of mine is gregarious, outgoing, always ready with a smart or funny response. She confided in me that sometimes she hears herself speak and wishes she could just stop, that she didn’t always have to fill the silence, that she could listen more deeply. Women’s speech is policed, both internally and externally. What we say, how and when we say, why we say it—all of these examined and judged lacking, again and again. Once, in a meeting with a male colleague, he told me that I was required to ask a question. I was, I suppose, too quiet for his liking, but he wasn’t inviting me into the conversation, he was demanding: I needed to speak at a certain time (right then) and in a certain way (a question). Knock explores the possibilities and complexities of the tongue: there is no one right way, no one right time. The voices of many different selves and women weave throughout this book; they choose to speak or speak differently, they listen and respond, they wrestle with tongues that save or betray them—“the tongue is the home of regret,” the place where “savage saints” wake, the way out and the way in. Like the women of Knock, I hope this book gives readers the time and space to lift their tongues and begin. I hope you enjoyed Melissa’s post as much as I did! There were many truths in there, and I hope that one day everyone’s words are valued as much as the next person’s. Good luck if you enter the giveaway!